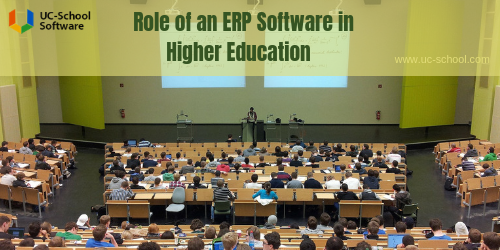 How does ERP software increase the efficiency of higher education studies? Higher education refers to that stage of education which commences on the completion of secondary education. This kind of education is offered by colleges, universities, conservatories, seminaries and also vocational training institutes. Higher education most commonly includes rigorous practical work, pedagogy, research and other education related activities of universities. Universities impart higher education at two levels undergraduate and postgraduate levels. The courses which students pursue in higher education will be defined by their career goals and objectives. Students can choose from a vast array of courses like medical, engineering, commerce, design, etc. for their higher education studies. Each of these courses requires a special level of training and teaching methodology. Students should make sure that they put their entire efforts towards learning the fundamentals as well as advanced concepts thoroughly. The benefits of ERP software are plenty. A top education ERP software must have interactive features like document upload, examination result in a statistical format, group discussions, research papers, online tests and syllabus planning, all of which increase the efficiency level of students as well as teachers in higher education studies. Using ERP software, teachers can upload important documents relating to the subjects of the course. These documents can include notes of the subjects, previous year question papers, homework and assignments and others. Students can make good use of these documents by downloading them from their portals. This will help the students in getting additional information, regular practice and in-depth knowledge of the subjects which they learn in their courses. Without ERP software, students, as well as teachers, find it very difficult in doing a proper comparison of examination results. ERP software simplifies this activity, by using analytical tools which calculate and compare results of all the students of the class in the quickest possible time. This happens by way of processing the data of the examination results entered by the teachers, after which the software automatically calculates and shows the performance of all students vis-à-vis other students in a statistical format using bar graphs, pie-charts, etc. By properly analysing this comparative data, students will be motivated to do better in their upcoming exams. ERP software has a unique module called the ‘Group discussion module’, which brings together the students and teachers on the virtual platform. Under this module, the teachers can have interactive discussions about the subjects taught, with the students of the respective classes. The teachers can ask the students to put forth their doubts and questions relating to the homework and projects assigned and also about the concepts which they would not have understood in the classroom. Such regular online group discussions facilitate speedy solving of subject-related doubts of the students. In some of the higher education courses like those at the postgraduate level like MBA, MSc, M.Phil, M.Tech, etc. extensive level of research needs to be done on a regular basis. The research papers done in such courses can be shared by the students with the teachers very easily using ERP software. They can even publish such research papers on the institute’s website, which will greatly assist in spreading newfound knowledge and ideas to people. Education ERP software enables the institute to conduct regular online tests, which the students can take anytime and anywhere. Such kind of online tests helps the teachers in knowing how well the students have understood the concepts of the various subjects. Students can benefit from these tests by identifying their weak points and thereby taking appropriate steps for the improvement of the same. Students as well as teachers can make use of a very effective module provided by Education ERP software called ‘Syllabus planning’. Using this module, teachers can plan in advance what topics they would like to teach to the classes which they are assigned. The syllabus plan made by the teachers can be communicated to the respective stakeholders like the students, parents as well as the management. All the above- mentioned features of Education ERP software provide a clear idea of how the students and teachers of the institutes of higher education studies can benefit by using the software. Hence, it is highly imperative for such institutes to adopt top education ERP software which can contribute towards improving the efficiency of both the students and teachers.